Hi, this is Alan. Thanks for reading. Contact information is at the far bottom of page. 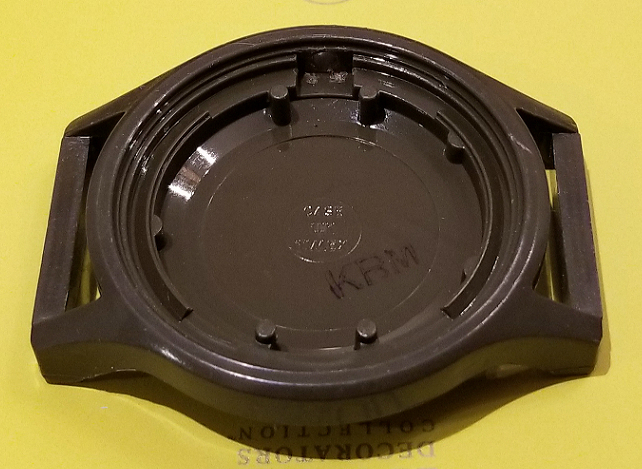 Why take apart this watch? Well, the Camper Watch is a tough nut to crack. There is no caseback. Any work on the watch or exposure of the parts needs to be through the front, after removal of the crystal. Consequently, there hasn't been a lot of documentation of what the internal components look like. I'm certainly not the first layperson to open up one of these. 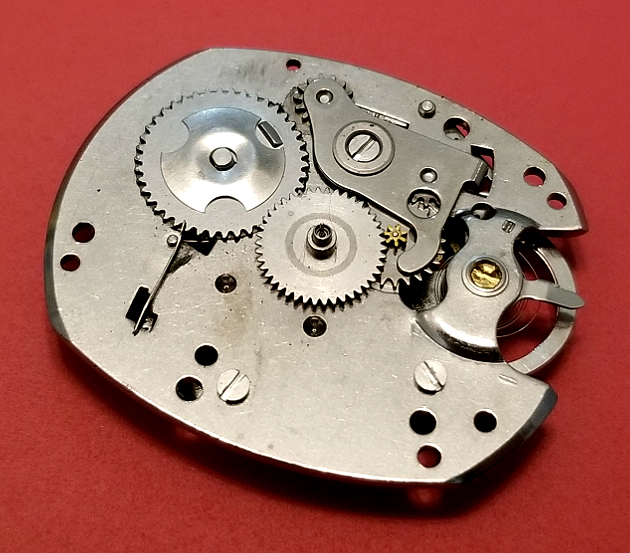 I've seen one ebay seller, a watchmaker from Florida, who has partially taken apart the watch, in order to show the parts to prospective buyers. I wanted to more fully take it apart, and take better photos. Not in the interest of convincing anyone to buy it, but to better understand this watch, and to share what I may have learned with others. Firstly, though, I want to say that nothing here constitutes any professional watchmaking advice! I am a novice, and I was working on a watch that was broken already! I do not recommend anyone performing these steps on their own Camper. Doing so with a working watch has a good chance of rendering it non-working. Doing so on any watch has a chance of damaging the dial, the hands, the case, and other potential damage. 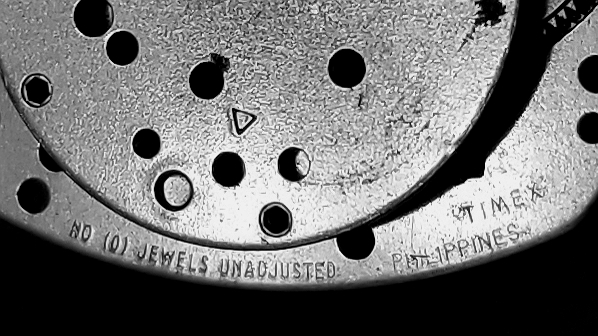 The "hidden date code," obscured by a metal ring, present on all Camper Watch dials, until approximately "1992." I had previously done more minor work on Campers. 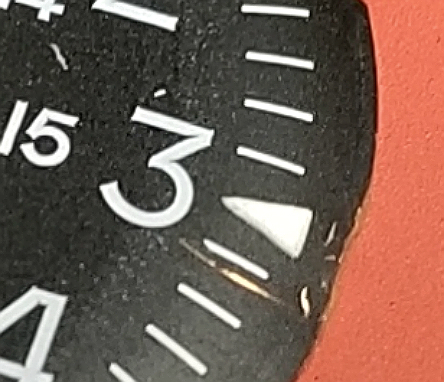 On a few other Campers, I had just opened up the crystal and removed the metal ring (see below) in order to determine date codes at the bottom of the dial. 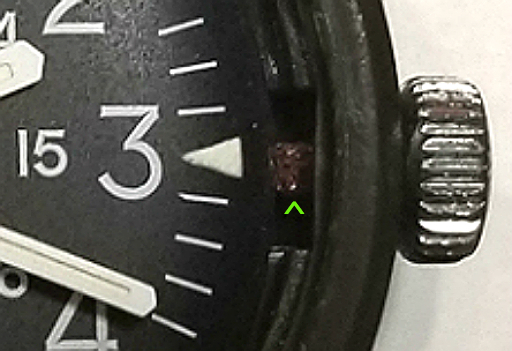 These codes are hidden when the watch is intact, obscured by the metal ring. 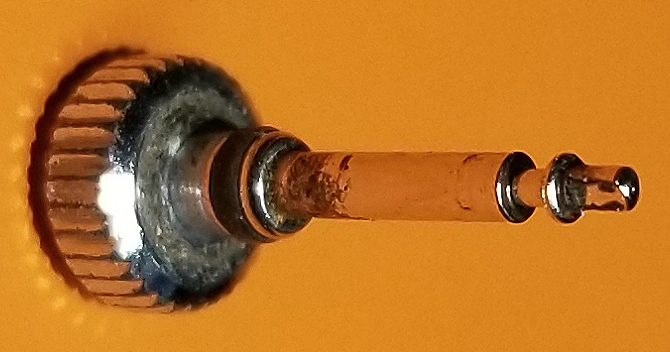 This was relatively easy, using a standard crystal lift, though greater squeezing of the crystal was needed to remove it. I think this is important, more on this below. Once the crystal was removed, the ring is carefully removed with forceps. This whole procedure was not overly difficult. 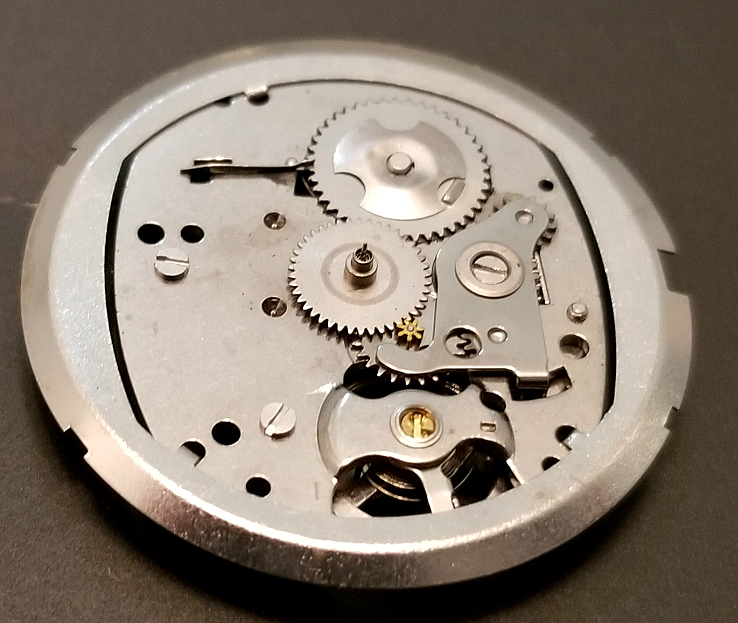 But removing the stem/crown so that the movement could come out was not easy. In particular, it was not easy to do without destroying the dial. Sadly, like a bad scientist, I took no photos of the watch before taking it apart! But above is a watch that is essentially identical. It is a Camper Watch from 1983, and I and cannot detect any differences in the intact appearance, between the watches. 1. 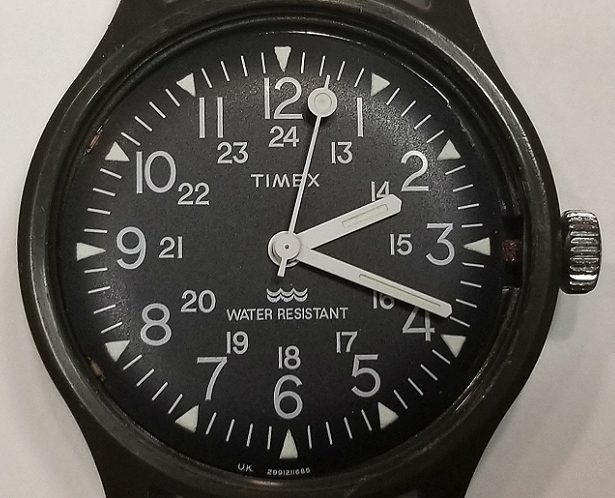 The mechanical Camper Watch from TIMEX 1983-1994. Review/pics of 3 samples, and much info. 2. Demonstration of a 1983 Camper Watch, by revealing date code. The earliest known example? 3. 1983 magazine ad for Camper Watch ("The Marines Watch,") in an Italian comics magazine. 4. The "Original Camper." 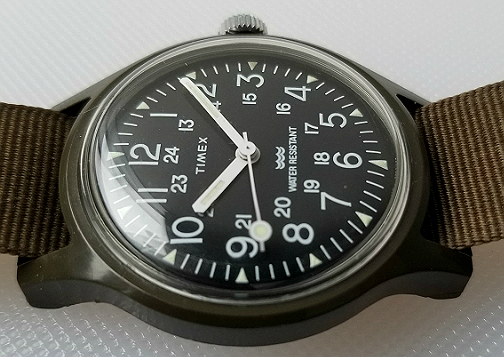 2015 revival of the Camper Watch, by TIMEX Japan. Remarkable origin story. 5. TIMEX "Mini" Camper, 1983. A much smaller version of the full-size Camper. Very fun. Orange hand. Back to this 1985 watch. So, here it is with the crystal removed. Notice at the edge of the dial is a dark, metal ring. This obscures the date code at bottom of the dial. It also mostly obscures the stem of the crown. It is easily removed with a pair of small forceps, or lifted up by the edge of a small, fine blade. It rests there, and it not in any way attached or anchored to anything. Notice the TIMEX sign on the dial is from the early (1983-198?) Campers. Straight lettering, not slanted/italics. 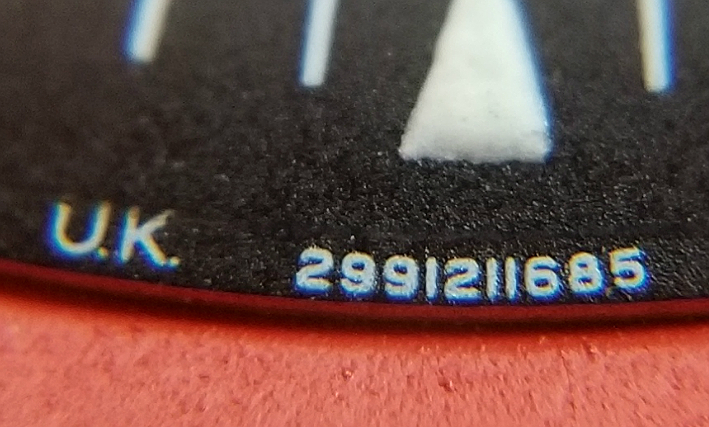 Once the ring is removed, you can see the small date code at the bottom, printed on the dial. You can also better see part of the crown's stem. The below pic is magnified. Sorry it is a bit dark. The green arrow points to the stem. There is a bit of oxidation on the stem. The stem is mostly round/cylindrical, but there is a flat part that has been cut out of the cylinder, and I believe in this pic, the flat part is facing the camera. A very kind watchmaker from Florida explained how he removed the crown. He said he used needle-nosed pliers to grasp the crown, and while it was held by the pliers, he turned the crown counterclockwise in order to unscrew it. Once the crown was removed, the entire movement could be removed by slipping it toward 9 o'clock and forward, and it just comes out. I struggled to find a needle-nosed pliers small enough to get into the gap (maybe 1.2 mm?) Too large pliers, and you'll dent the margin of the dial, and/or scrape off paint. I tried to make the tips of the pliers finer by filing them down, as the ones I had didn't fit. I grasped the stem, and tried to unscrew the crown. It just wasn't coming off, and the stem kept slipping past the grip of the pliers. My right thumb and second digit were getting sore and red. I was about to give up. Then, instead, I grasped the crown itself with the pliers, and pulled and it just came out. It overcame the clamp & screw assembly that holds it in place. Once the crown was out, the movement came out easily. 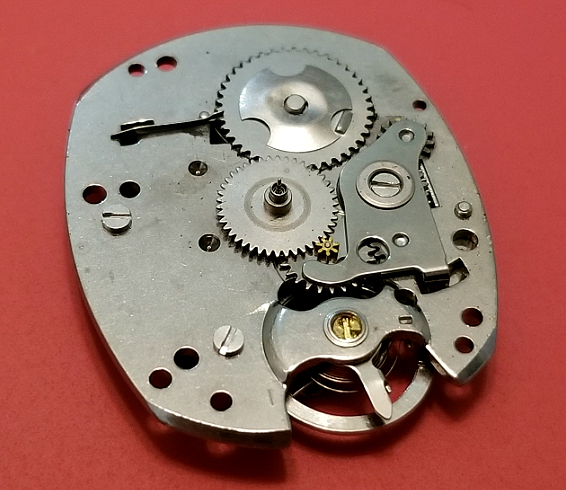 Look at the damage I did to the dial, while unsuccessfully trying to remove the movement by grasping the stem with the forceps. 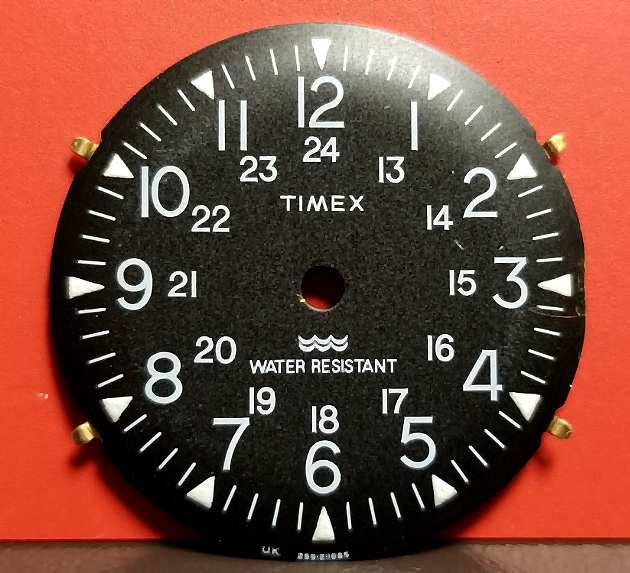 The edge of the dial is slightly dented, there has been loss of black paint from the edge, and you can see scratches where I slipped, and the pliers took off some of the black paint, to reveal the brass base of the dial. 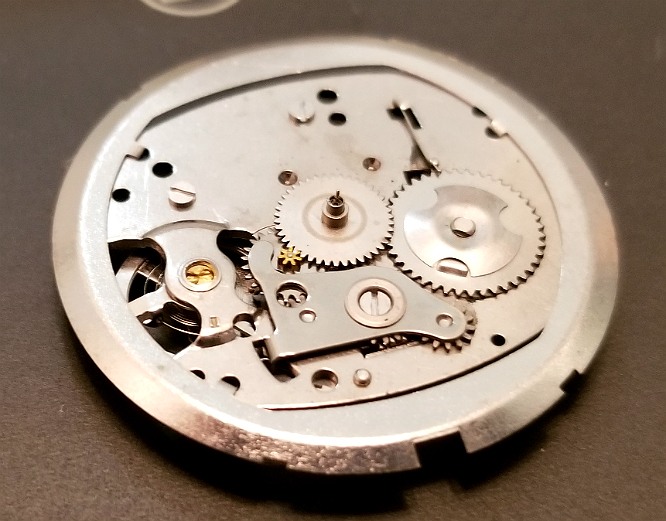 Here is the dial still attached to the movement. 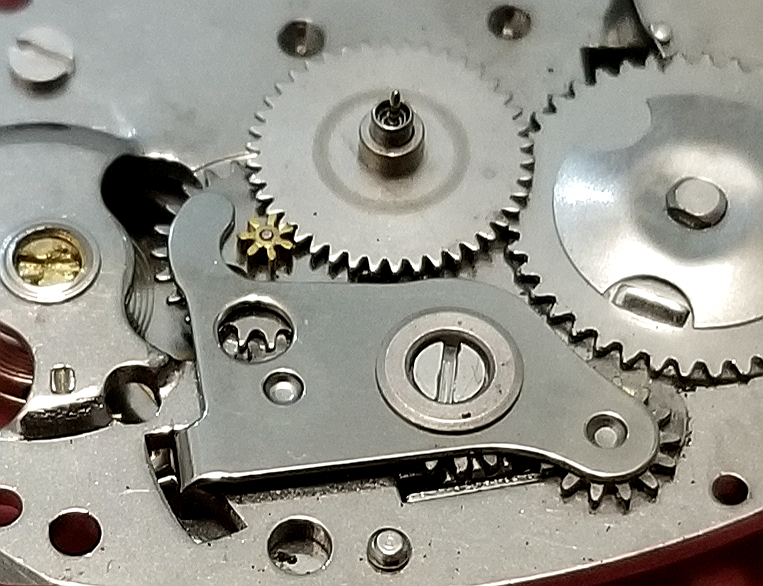 You can see near 8 and 10, a small part of the dial is unpainted, where metal tabs (extensions of the metal dial) are bent back, holding the dial to the front plate of the movement. 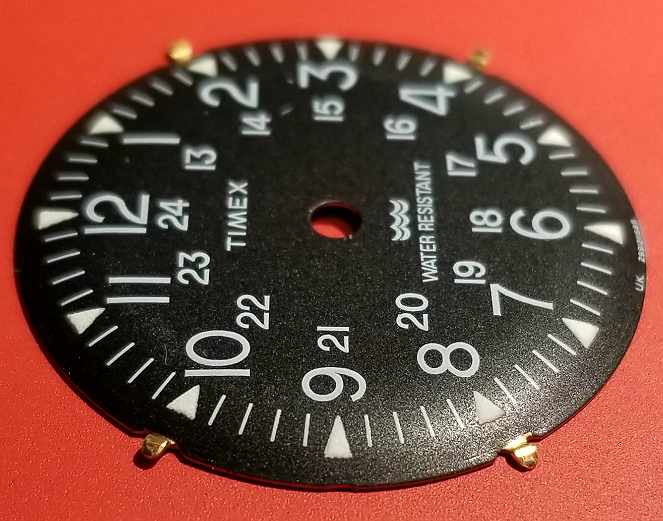 Here's a look at the parts where the hands attach, protruding through the hole in the center of the dial. I'm not sure if these are called "posts" or "pinions," but the larger one is for the hours, the medium one for the minutes, and the small one for the seconds. Gently pressing back to "unbend" the tabs releases the dial from the rest of the movement. Notice once again the date code. Also, it's clear some of the damage that was done, nicks here and there, along the dial close to 3, especially seen in the below pic. Good look at two of the four dial tabs. 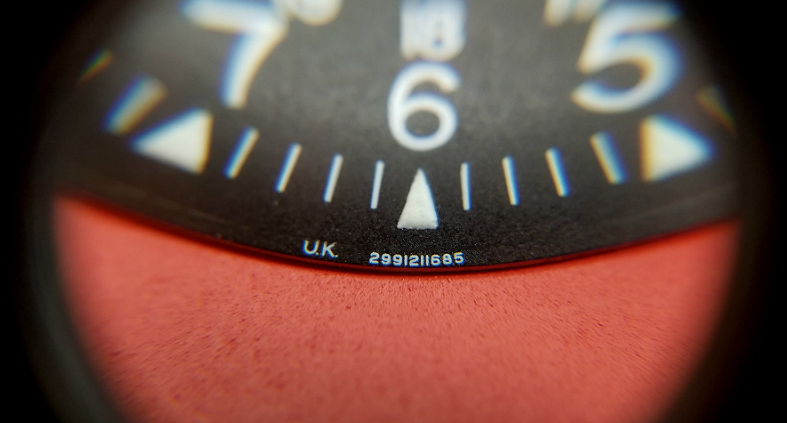 Dial made in the UK. Model no. 29912, movement 116. Dial was manufactured in 1985. 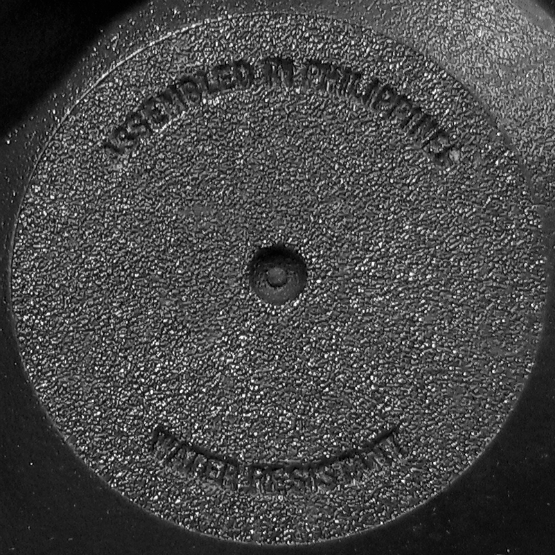 The watch was assembled in the Philippines. The earliest Campers were assembled in Taiwan. I have four Taiwan Campers, two with 1983 and two with 1984 on the dial. At some point, it seems that Camper assembly moved (forever) to the Philippines. I believe this transition happened sometimes between 1984 and 1985. Note: although this dial was made in 1985, it's possible that the watch was assembled later. I have one Camper that has a dial that indicates it was made in 1988, but the Camper into which it was installed was embossed on the back of the case 1991. 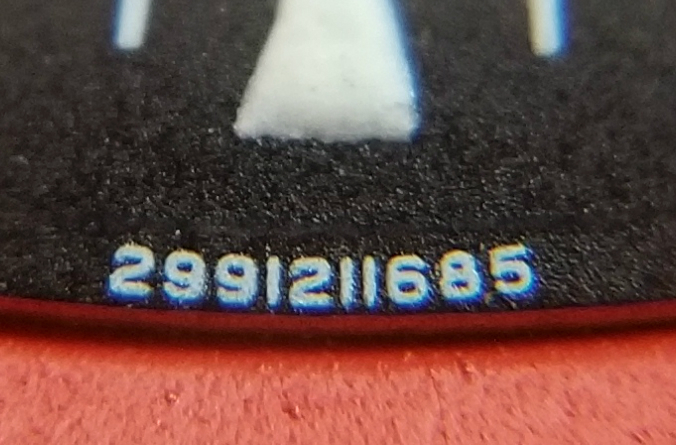 This 1988-1991 "discrepancy" can be explained as follows: in 1988, a batch of dials was made at the UK production facility. They were either shipped all at once to the Philippines, or kept in the UK until needed in the Philippines. Regardless of where they spent the better part of three years, there must have been a surplus of dials, compared to production. 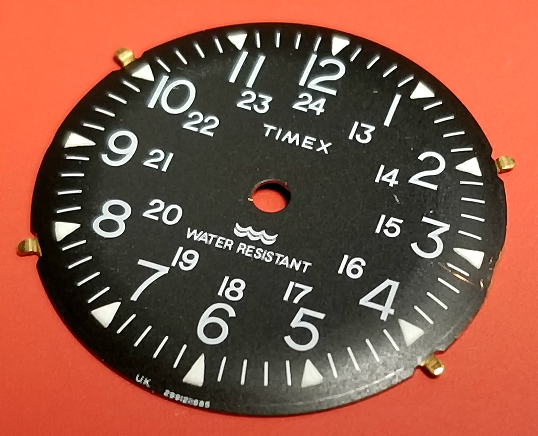 So, as watches needed to be made, the dial supply was accessed, resulting in a 1988 dial being used in 1991 when the whole thing was finally assembled. There are probably many of these Campers where there is a "dial delay." 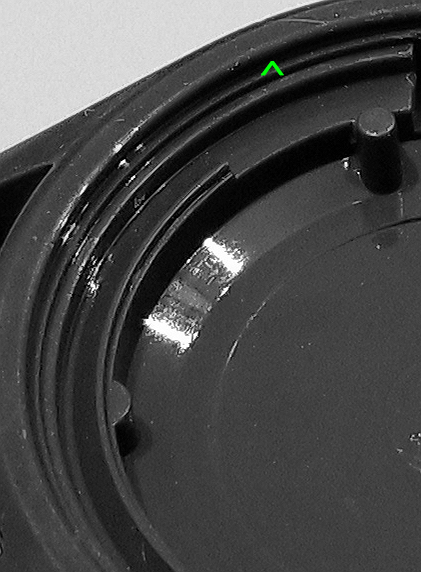 (BTW, this Camper shown on this page that I have taken apart does not have a caseback code. 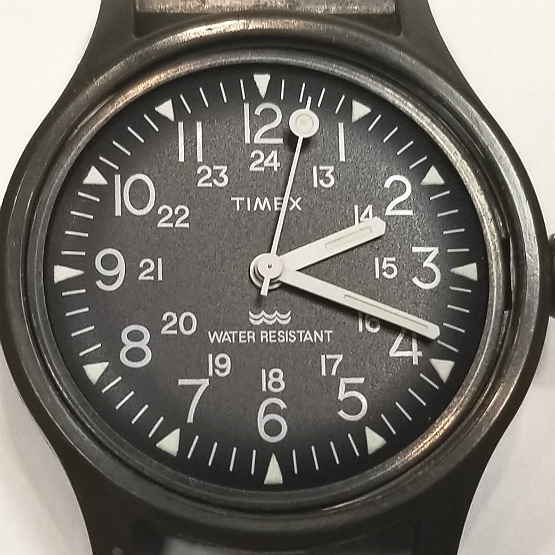 Those came in around this time, 1985, but it looks like not all TIMEX got the case stamps. The stamps for the date code are very small. I'm estimating at less than 0.5 mm tall. To take a crisp photo like the zoomed-in ones above, I had to put a 15x jeweler's loupe up against the aperture of my phone's camera and take the pic. Here is the raw image. Thanks goodness for lots of megapixels that allow zooming into this without much loss. 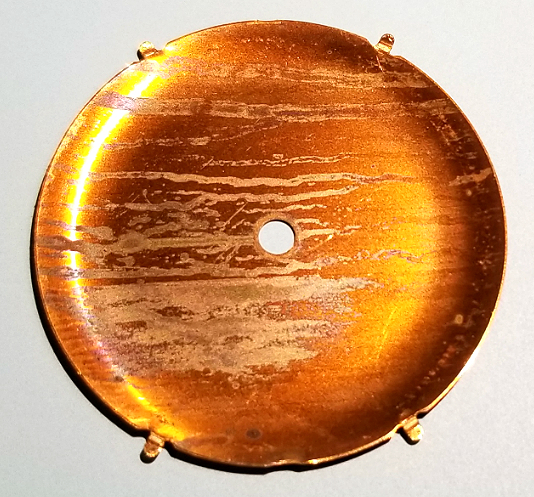 Looking at the back of the dial, you can see the brass composition, looking starkly different from the nicely painted dial. You can also see these streaks of "something" going from one side to the other. Looks like "drips," but I'm not sure. Maybe some water got into the watch, streaked this way, and caused the dial to oxidize and leave this kind of "print" of the effect. Couple more pics below. Couple more views of the pattern on the back of the dial. 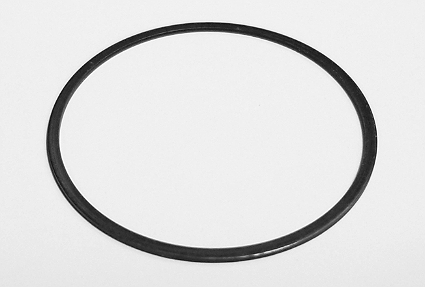 Here is the metal ring, on its own. I believe this is also made of brass, and coated in something black. I've seen others where slight scratches in the black reveal a yellow-orange color beneath, that I think is brass. This ring appears to be to stabilize the movement/dial assembly. I have one Camper that is missing this ring, and it rattles around slightly. Closeup of the crown and stem. 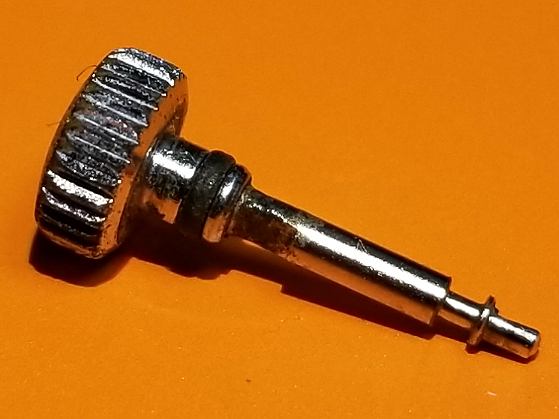 I can't figure out what part of this unscrews. Is it at the "flat" part of the back of the crown, where it appears flush with that wide part of the stem? Or is it at any of those other rings. Notice the black rubber gasket, for water protection. I wonder if the part that unscrews is all seized up from rust or other kind of oxidation. I contemplated putting a drop of WD-40 lubricant in there as I unsuccessfully tried to unscrew it, but I thought that might make everything messy and slippery. Let's now turn to a feature which helps to define the Camper Watch. 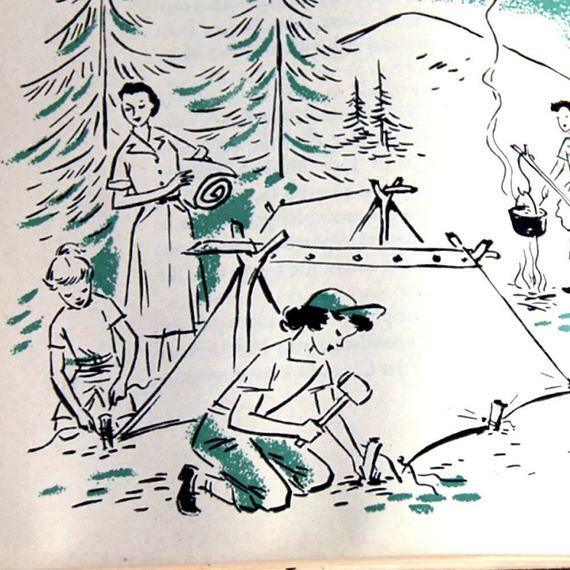 Remember, first, that this commercially-sold Camper Watch derives its "DNA" from an October 1964 US Government specifications for an inexpensive, non-repairable watch that did not require the accuracy of more expensive watches. 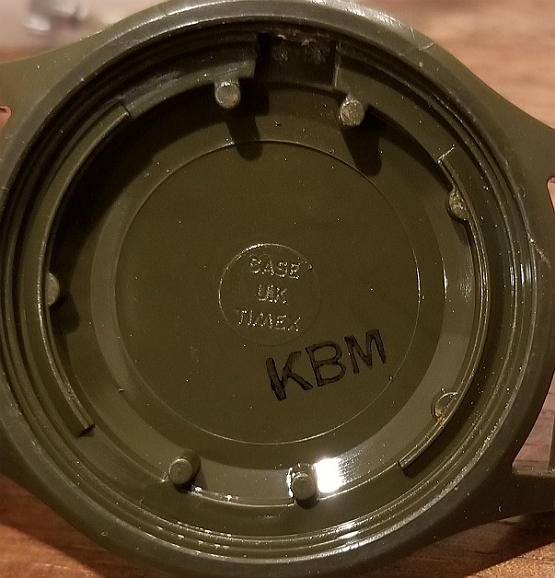 From this page on the MIL-W-46374, this quote is taken from the actual government specification: "This specification covers one type of plastic-cased wrist watch intended for use where a high degree of accuracy is not required. The watch is not intended to receive maintenance support within the military supply system." This was written in 1964, as the conflict in Vietnam was intensifying. From that same website: "The expanding Army, just beginning to ramp up its involvement in Vietnam, needed a more basic and less costly wristwatch for its hundreds of thousands of troops. The specification, MIL-W-46374, provided for the needs of this large and growing segment of the military." Why is this important, and why do I chose to discuss it in conjunction with describing the case? Well, it is arbitrary, and every aspect of that MIL-W... specification was important to the whole. I suppose, maybe, it is that the case is so vastly different from most other watches. Secondly, the lugs are "solid." 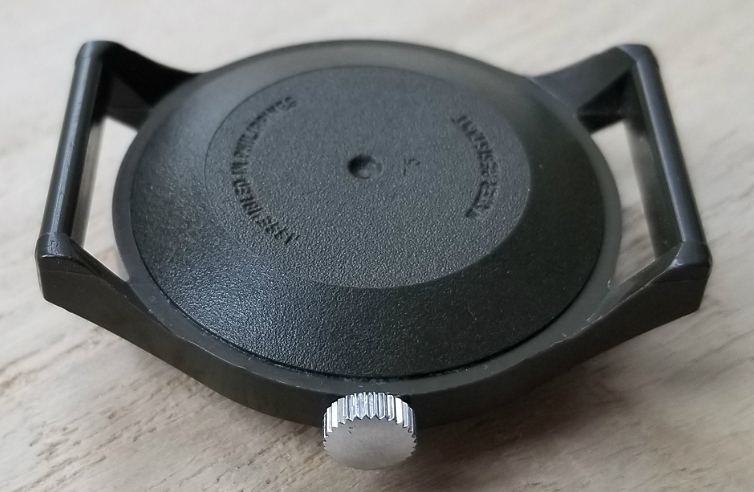 Instead of spring-bars or "pins" at the lugs for holding the strap to the watch, the area between the lugs is filled in by a continuity of the mold, for a solid bar across. This means you will never lose a watch, as long as it's properly strapped to the wrist. 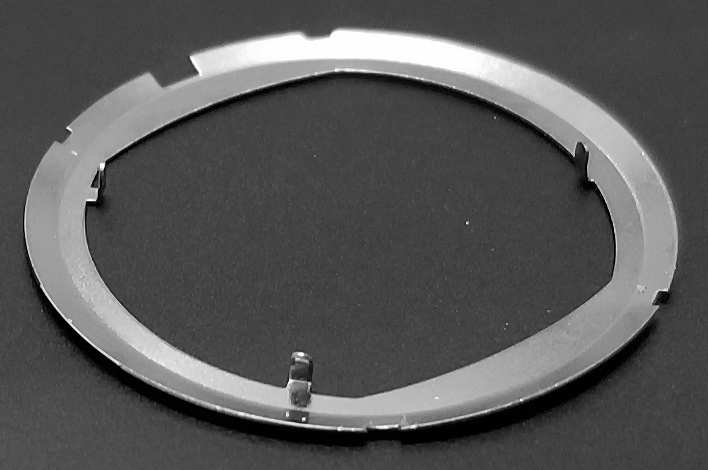 With a conventional watch, springbars can come loose or break, leading to loss of the watch. In particular, when there is tension applied to the strap and/or watch head, as in combat/training, heavy labor and other activities, this could be more likely. I lost a watch once, by springbar failure. I was carrying my 3 yr old daughter who was fussy (I consider this a form of combat) along a treacherous and narrow stretch of sidewalk along London's South Bank area, and it was gone. Just gone. Finally, the watch has NO REMOVABLE CASEBACK. This is not the watch I took apart, but the back is identical. Notice that the back has what *looks* like it could be a removable caseback.The back has an upslope at the edges, and flat in the center. Thousands of metal casebacks are shaped just like this. 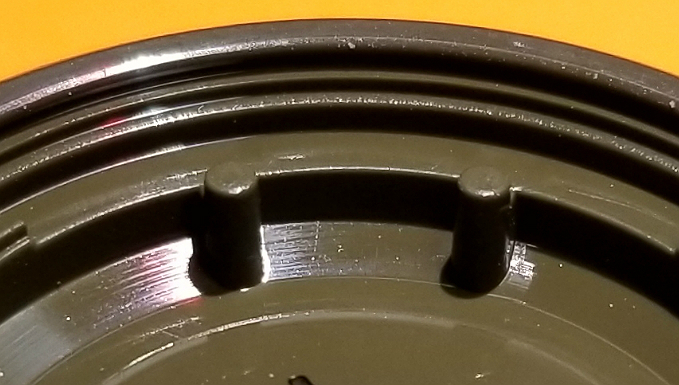 And there is a *very deceptive* edge or rim where that sloping part meets the rest of the case. 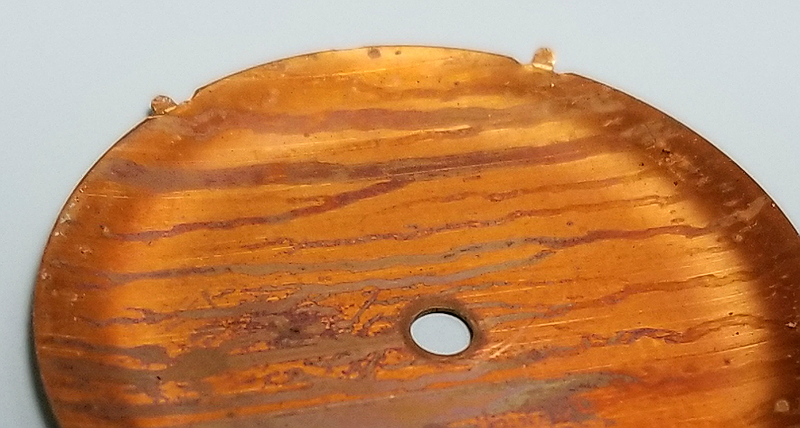 THIS EDGE HAS FOOLED MANY MANY PEOPLE INTO TRYING TO "OPEN" A NONEXISTENT CASEBACK. I've been numerous examples of this, where there are characteristic deep scratches where someone tried in vain, with some sort of tool, to remove the back. But of course, it never did work, but many gouges and scratches resulted. I want to digress a little, from the case, right now. But is is related. I want to comment about the long-term functionality of the mechanical Camper Watches. And by this I mean that a large majority of these vintage watches are not only running, but running well and generally keeping good time. This includes watches from 1983, 1984, that are 35 years old. It is actually kind of hard to find a Camper that isn't working, though of course there are some, like this that I took apart. To me, this is noteworthy. Many old TIMEX watches from this era are still running as well, of course, but I see a greater consistency of function with the Camper, than with others. 1. Inexpensive, "non-fussy" zero jewel movement. More on this, below, but it uses an evidently very reliable movement 116 which in some cases is running perfectly 35 years later, with zero maintenance. 2. Waterproof nature. Which extends to dustproof, as well. 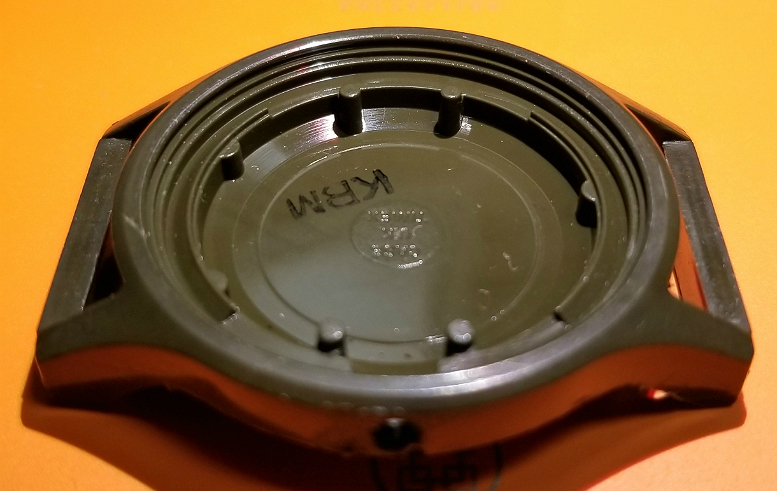 Of course, the lack of a caseback means that's one less place where water can enter the case. The crown/stem sealing must be very good. But the crystal/case junction (which I really haven't talked about yet) may be key. It was really very difficult to remove the crystal. You needed to squeeze it *much* more than a typical watch, in order to deform it enough to allow it to be pulled free. 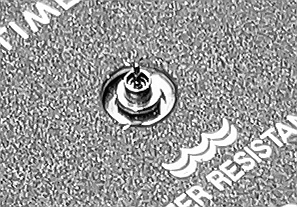 As shown below, there seems to be a really deep circular trough where the crystal slots in when installed. The difficulty in removing it suggests to me that it's quite a tight seal, and water and dust would be excluded from the watch. 3. Because there is no caseback, no curious owner could ever get it open to have a look. Less likely to introduce dust, and cause other problems. 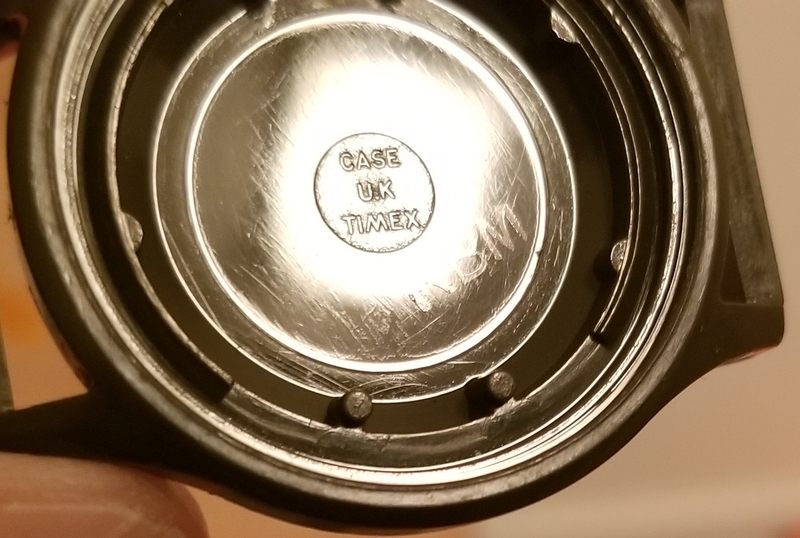 CASE U.K. TIMEX is molded on the inside of the case. We have also seen that the dial is made in the UK. (See date code on dial, above.) I am unsure where the movement (or crystal, stem, metal ring) was made. All parts were then assembled into a whole watch in the Philippines. 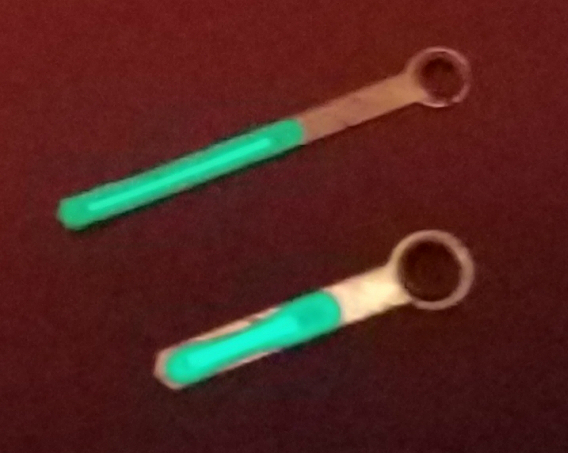 In this picture, the green arrow is pointing to the deep, circular trough that the crystal slots into. Just central to that is a narrow "shelf" where the metal ring sits in place. Another look at the deep crystal trough, and just central to that, the shelf for the ring. Other architectural features of the inside of the case include those four pegs sticking straight up, and two ridge-like arcs of 90 degrees opposite each other, one having two semilunar "tabs" protruding centrally, the other having one peg. I believe all of these features are designed to engage with the movement and back of dial, holding everything into place. Another look at CASE UK TIMEX. KBM stamped in black is likely some factory production code. I was about to talk about movement as a natural and final overview of this watch, and realized I had forgotten to talk about the hands! As can be seen in the pic below where the hands are facing "backward," the hands are made of brass (or copper?). So much brass in this watch! Painted white on the front side with luminous paint applied.. You can see how the paint has been applied from the back side, to create a crisp, sharp border of luminous through the cut-out windows. I assume this was done by hand. 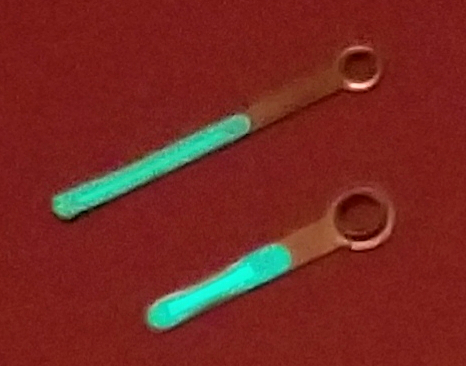 In low-light conditions, you can see the luminous material shining green through the openings in the hands. 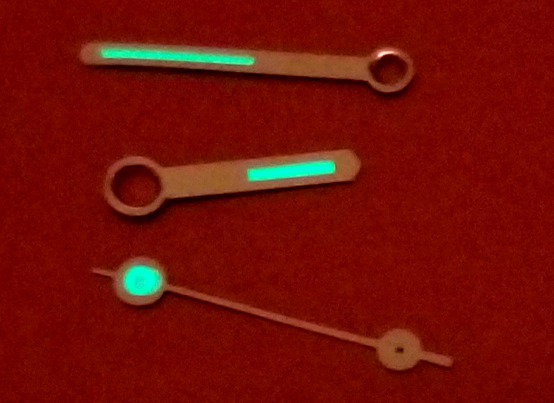 Turning the hands around and shining light on them, above and below pics, you can really see the glow. 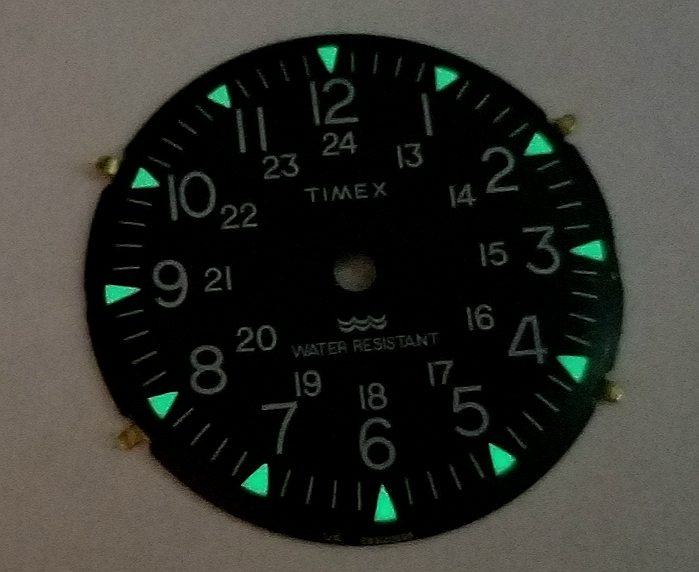 As long as we're showing glowing hands, here's a photo of the glowing dial. Notice the hour markers are all isosceles triangles, and the ones at 12, 3, 6, and 9 have a greater length to the equal sides. 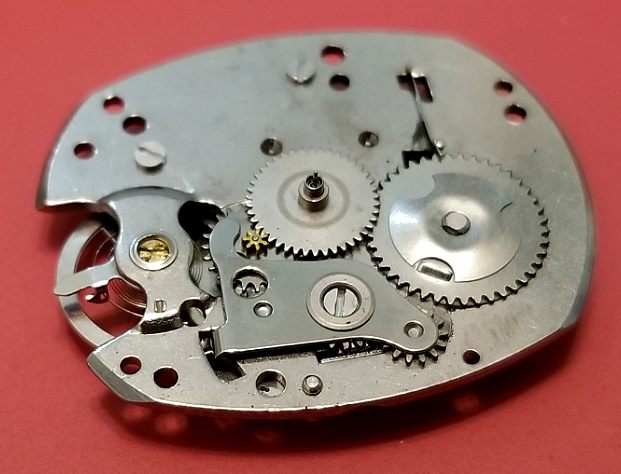 I don't know much about the movement #116 which is used in this watch. There is almost nothing about it, on the internet, except for this page, where someone has listed some of its features. This includes zero jewels, 42 hour power reserve, and an escapement with frequency of 18,000 vibrations per hour. 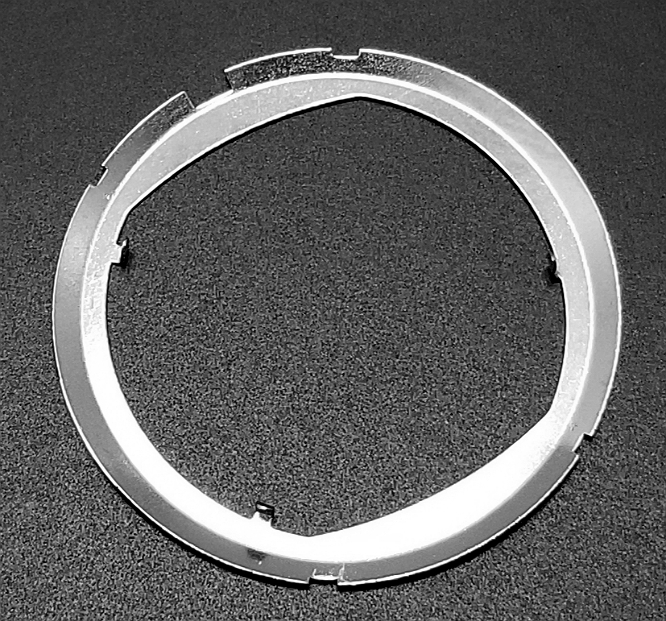 I will start a bit backwards, by showing a ringlike metal support device that appears to be aluminum. Light, malleable, and has no sign of oxidation. 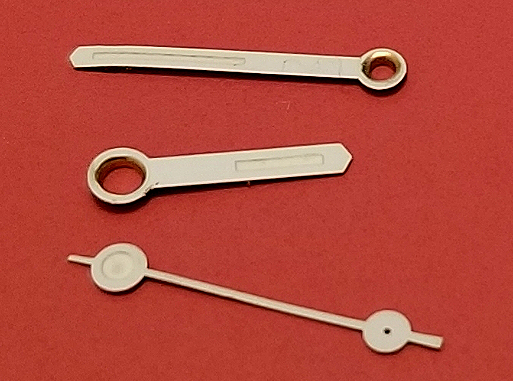 The movement is secured to this device by way of three tabs that are placed into holes in the movement plate, and then bent in. In particular, the image below shows these tabs well, sticking straight up after being un-bent. You can see rectangular gaps at the edge. The largest one I think is to accommodate the stem. Here is the entire assembly, movement and the support device. 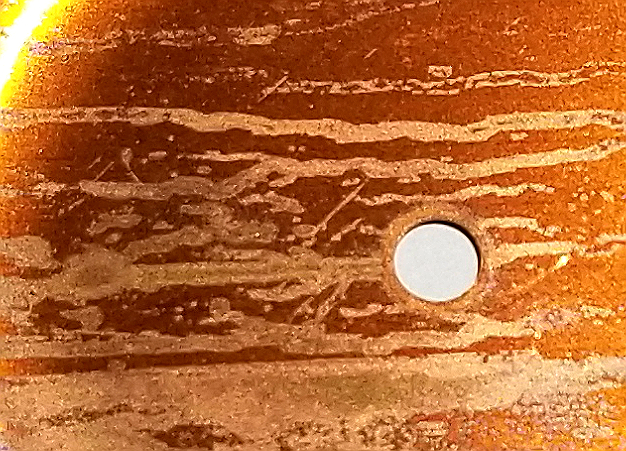 You can see where the three tabs have entered the plate of the plate, and then are bent to stay in place. We are looking at the side of the movement that faces the backside of the dial, "the front" of the movement. Some pics of the movement, front side. 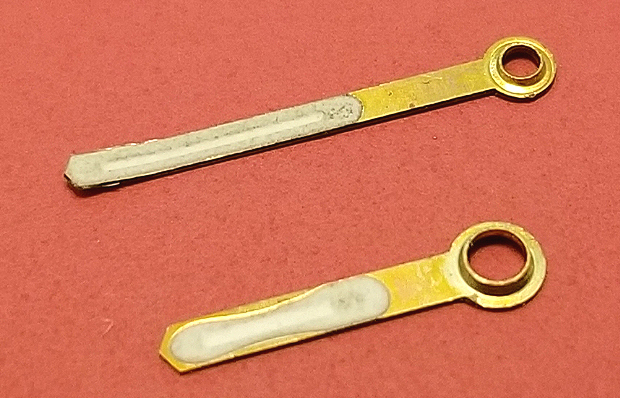 Some brass colored parts visible, mostly "grey metal," and I'm not sure the compositions of the different parts. Steel? Nickel? Aluminum? Balance wheel and escapement to the left, above. The wheel for the mainspring is the large "gear" on the left, above. The thin wire or clip engages the teeth of the wheel, and prevents it from turning the wrong direction, keeps tension on the spring. Top-center, you can see the three "posts" for the hour, minute and seconds hands. 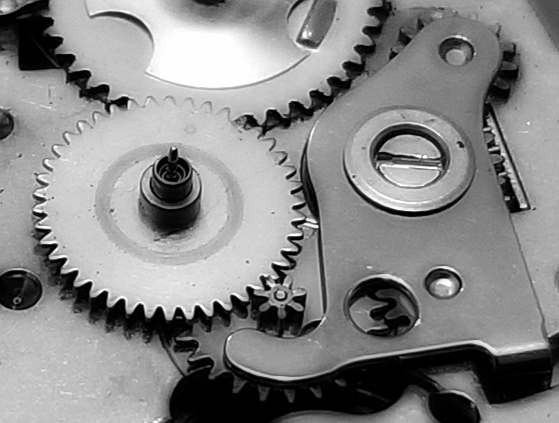 I love all the "gears." Movement seen from back, with the outer support device still attached. To the left you can see the rectangular cutout at the edge of the support device, to accommodate the stem. 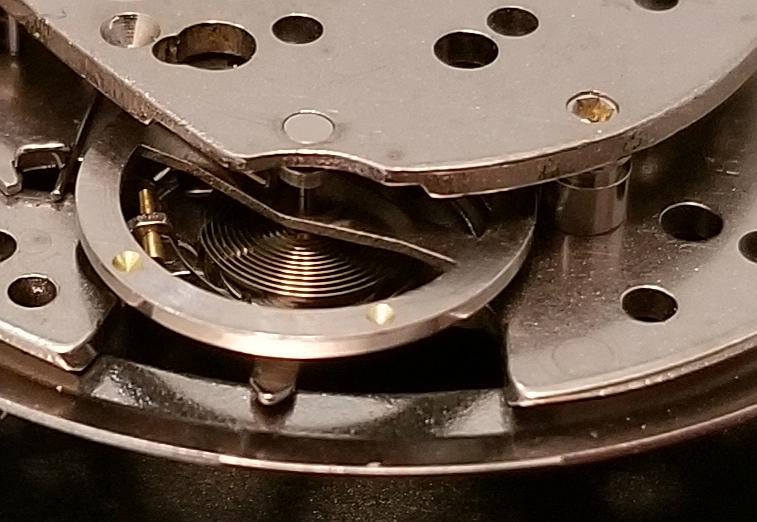 Nice look at the balance spring, or "hairspring." Notice also on the balance wheel those tiny "divots" that have been drilled out. This was done at the factory, when the balance wheel was "poised." In order to create the center of gravity at the center of the balance staff. Due to inherent nonuniformities in manufacturing the balance, there will be slight mass imbalance that needs to be rectified. This is accomplished by removing tiny amounts of mass from the balance at various locations until mass is evenly distributed.In addition to having this done at the factory, balances are sometimes re-poised by a watchmaker if necessary to correct for acquired imbalances in the assembled system. But I doubt most TIMEX have ever had their balances repoised by a watchmaker. Certainly none of the Campers. In fact, I doubt very many Campers have ever been worked on by anyone, due to the inherent difficulty at even getting to the movement. 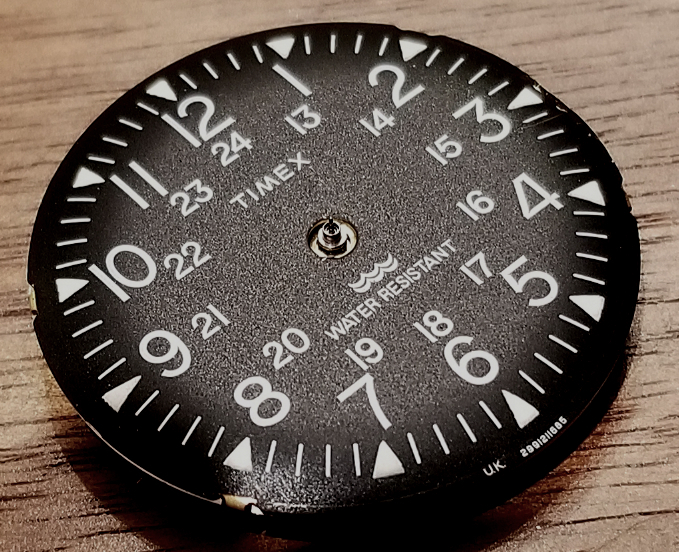 I am curious about how TIMEX handled the warranty, for the Camper Watch. I doubt many of these were sent in, as this was such a robust watch, it's doubtful that few, if any, were ever sent in to TIMEX for repairs. If so, I think they would have most likely replaced the watch completely, send the customer a brand new watch, rather than open it up and fix it. I hope you have enjoyed this journey "into the interior" of the Camper Watch. 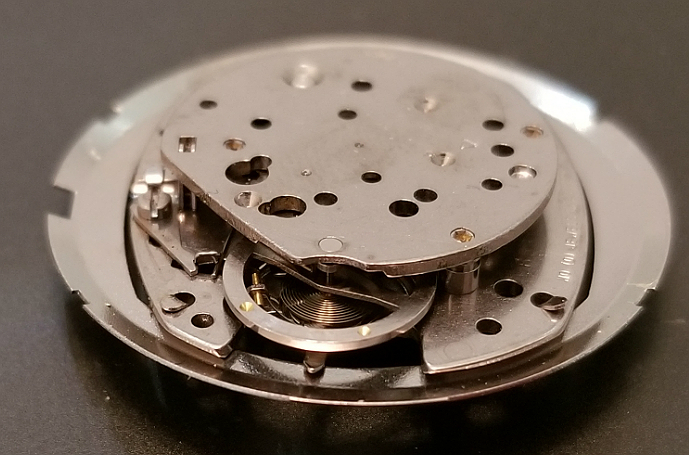 It has been fun disassembling the watch, and learning about all the components that went into making this such a sturdy, reliable, functional and truly great watch.